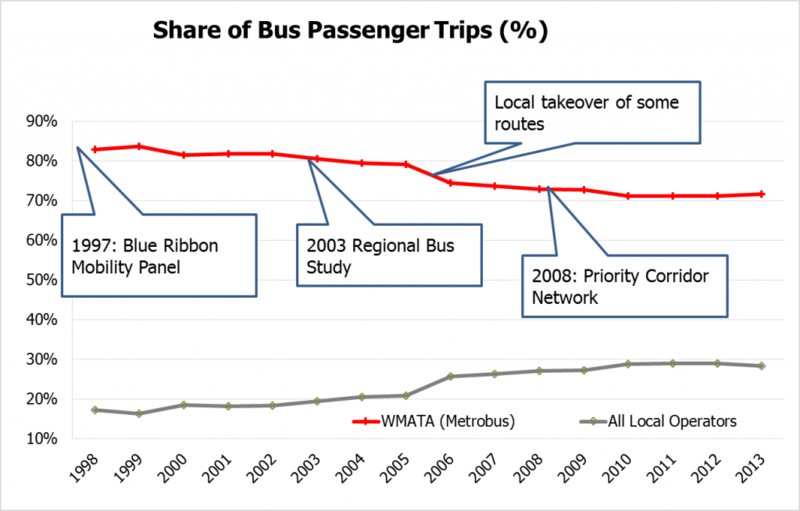 While Metrobus has added service through its Better Bus initiative, over the long term service has not kept up with the rate of increase of local bus operators in the region, such as Ride On, and Fairfax Connector. This is due in part to the growth of partner bus services, but also the occasional transfer of routes (PDF) from Metrobus to local operators. 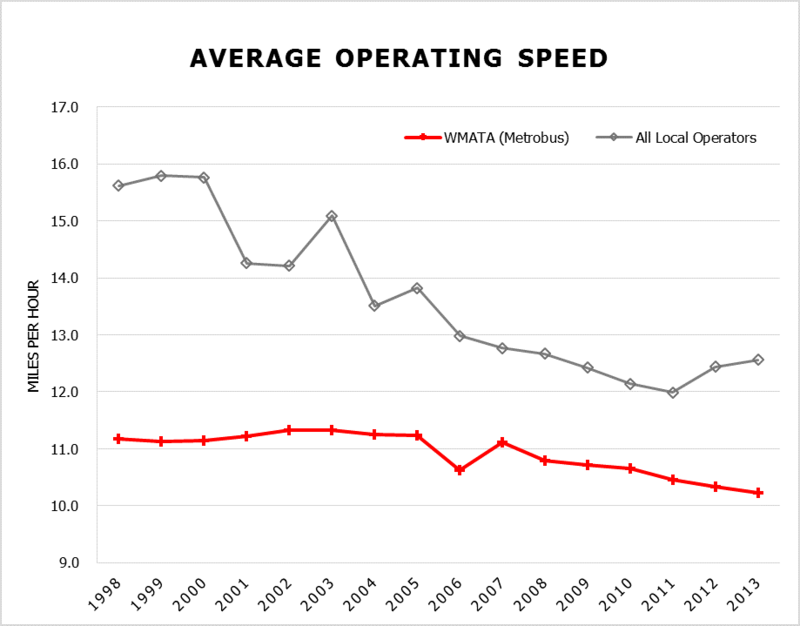 Perhaps of more concern, systemwide average bus speeds have tumbled over the past 15 years, with Metrobus losing about 1 mile per hour over the past 15 years, and local operators losing about three. Increased traffic congestion on transit-intensive streets is the most likely culprit, as demonstrated by buses which can barely top walking speed in the downtown core and elsewhere. Other factors eating away at Metrobus’ average speed include increased Metrobus boarding delays at high demand stops. With slower operating speeds, buses must be added just to maintain the same level of service, reducing transit’s buying power. Over the course of a decade or more, this can add up to millions in excessive operating costs. A future post will talk about some possible solutions to stabilize Metro’s market share and break the cycle of the bus stuck on traffic. You can engineer small solutions (signal priority, etc) all you want, but the answer is truly bus lanes as needed. That’s a political decision that local jurisdictions need to get behind. I’m not holding my breath. What’s the source of the Average Operating Speed data? 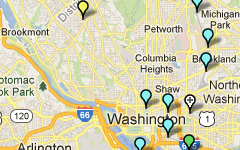 David, the source for the operating speed data was the National Transit Database. Bus lanes (or HOV/HOT lanes that don’t end up congested) are the real solution. Stop spacing, off-board fare collection, and all-door boarding can help a great deal as well. There is technology competition to Metrobus especially with heavy traffic. Metrobus has GPS, Fairfax Connector not yet, but expected early 2016. Knowing where your transit vehicle is, how soon is it going to come, helps you decide which mode of transit works best. Also Google Maps on smartphones – red or black traffic lines indicates congestion not a good route to take if have choices on any given day, so maybe another bus line or the Metrorail train. For some local non commuting trips, where stop or go of a bus or less direct routing of a bus, may make UberX using a smartphone an option – quicker, costs 30-40% less than a taxi, and better quality of service than taxi overall – if time pressure or need for reliability dictates it, especially for short or medium haul trips and/or having a couple of others sharing the fare with you. Since Time is Money, Metro Wants a Business Partner to Help Metrobus Go More and Stop Less Does Metrobus Need a Refresh?